Geocaching is a real-world outdoor treasure hunting game. Learn more about geocaching in Norfolk, NE! Visit Norfolk Area Nebraska wants to invite you to “Explore and Stay Awhile”. Norfolk is best known as the home to Johnny Carson, but there’s so much more for residents and visitors to discover. From festivals that draw thousands to the area and unique shopping experiences, to entertainment and recreational activities, the Norfolk Area Visitors Bureau believes there is always something worth exploring in the Norfolk area. It’s in that spirit of exploring that we invite you to come discover Norfolk and the surrounding area like never before – through our new Official Geocaching GeoTour! GeoTours are an amazing way to find those local “hidden gems”. Whether you are a native to the region, just happen to be passing through, or are planning your next vacation destination, our GeoTour is sure to lead you on an epic adventure of discovery in the heart of Northeast Nebraska! Get Your Geo Tour Passport! The Visit Norfolk Area Nebraska GeoTour is the first Official Geocaching GeoTour in the state of Nebraska! 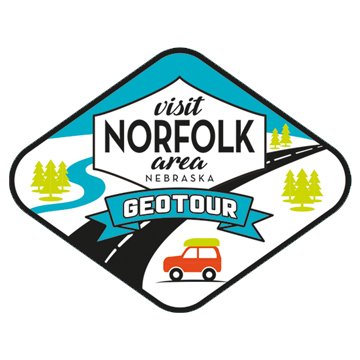 Upon successful completion of the GeoTour, you will earn a special digital souvenir for your Geocaching profile as well as the official Visit Norfolk Area Nebraska GeoTour Geocoin! Feel free to tour at your own pace. Some may strive to complete the GeoTour in one weekend, while others may choose to make several trips to take in the splendor all season long. The choice is yours!